Brown asks: (uploaded 18.08.2018) Does anyone recall Alfred and Minnie Civill who lived at 205 Cribb Parade, Cribb Island. Alfred was a “gearman” (?). Minnie Civill died ib 1954 and Alfred Civill died in 1974. My children’s great Grandfather was Frederick William Jones who apparently lived on Moreton Island until about 1925 or 1926. He and his father were allegedly involved in the movement of South Sea islanders into Moreton Bay. Frederick William Jones also had an oyster lease there. I can’t find any records for Frederick William Jones or for his father. I am hoping you will be able to give me some research pointers. 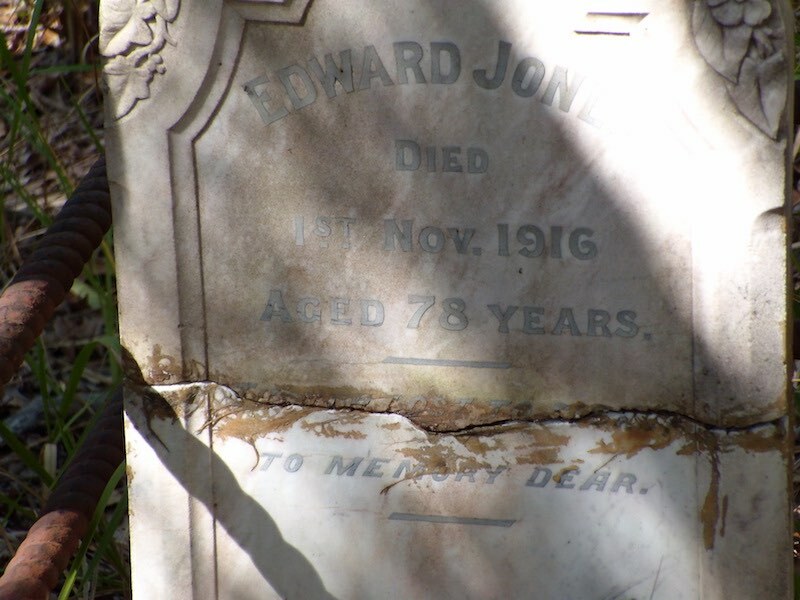 Could Edward Jones be Frederick William Jones’ father? I have attached two photos of the grave, and will be interested to hear your thoughts. Yes! Edward Jones is the father of Frederick William Jones! I have found the connection on Ancestry.com.Thank you so much for the precious photo of Edward’s grave. 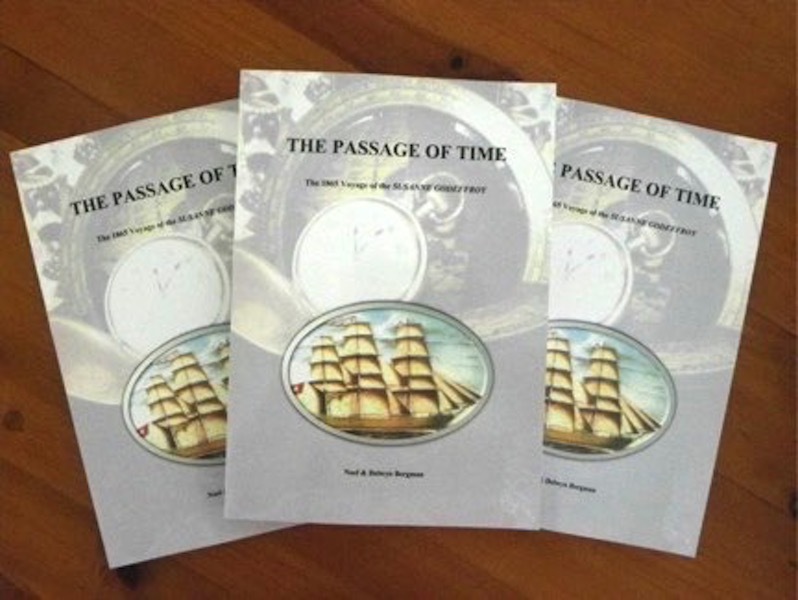 Our book, The Passage of Time is about one of the many ships that brought our Ancestors to Moreton Bay in the nineteenth century. The new Queensland Government was encouraging Immigration from Germany and Scandinavia. In 1865 alone, 2611 passengers embarked on eight different ships from Hamburg. One of these was the “Susanne Godeffroy” and she commenced her journey with 533 passengers, and was normal for the time, there were hatches and dispatches during the voyage. The “Susanne Godeffroy” left Hamburg, Germany on the 6th May 1865 and arrived in Moreton Bay, Queensland on the 6th September 1865. A journey of four months. 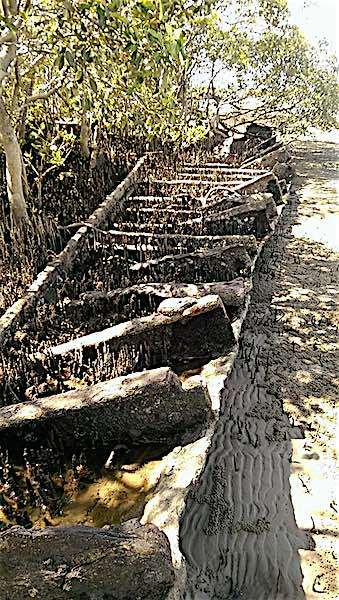 We have had this photo of a wreck in Boggy Creek near Myrtletown sent to us at the Queensland Maritime Museum, that is causing a bit of a mystery and thought you may be able to help. In the discussion, does not appear to be “Mosquito” or indeed “Koopa”, so can you shed some light on this??? “Some extra info, its approx 27m long and 7m wide, when I looked more closely I realised that’s its in an L shape, the foot of which is 11m long and 2.6m wide. The wreck appears to made from heavy iron or steel construction with round-top rivets approx 3 & 1/2mm in diameter. There was some wood, possible rib, sticking out of sand about 3/4 of the way along left hand side. 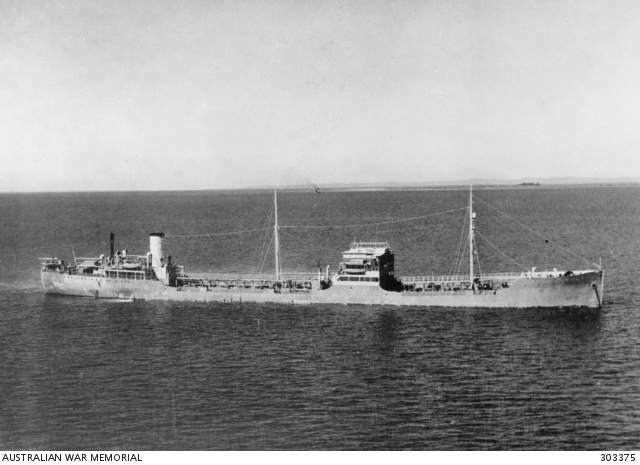 Mystery ship of Moreton Bay. Was she the MV Davara? 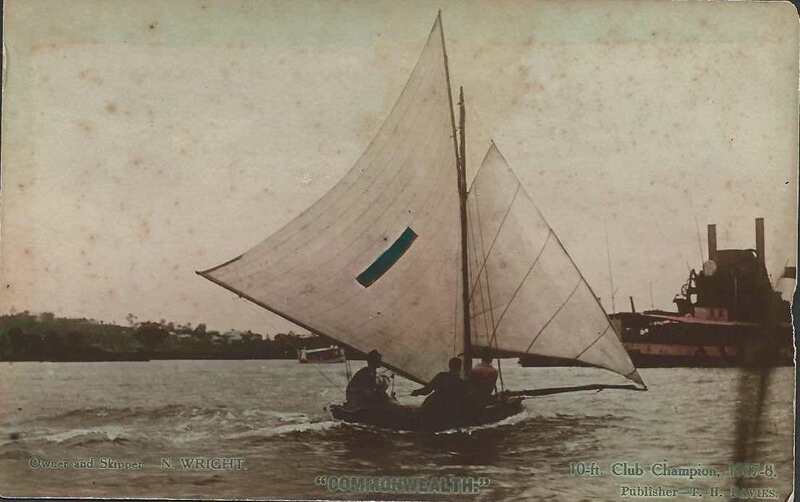 On our Queensland Maritime Museum`s facebook page there has been some dicussion about this vessel I am sending you..Am also sending some replies which may help. Apparently she was believed to have worked around Moreton Bay. Am hoping you may be able to help me out with this one. Owen Grimes I googled MV Davara, and all I could find was a fire aboard it 1959/60 in Tasmania. Neil Todkill Approx 1958 I went with my father on a vessel similar to photo to Bribie Island with drums of Bitumen for the first sealed road on Bribie Is. The 3 miles from the surf beach to the Bribie Island jetty. Warwick Lynch Maybe if someone is familiar with the”K” on the funnel? 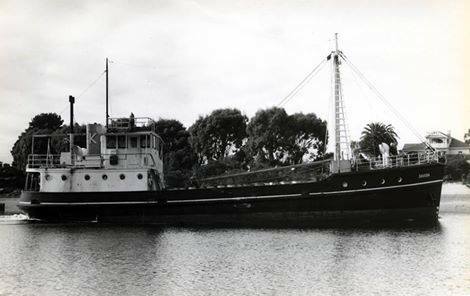 Peter Conlon Hi Warwick Lynch, just digging around on the net and come up with the following records, it explains the “K”: 22/10/1959 DAVARA, 145/47-m.v., owned by the Kimberley King Island Trading Pty Ltd, has been abandoned by her owners as a total loss as a result of damage sustained when fire broke out on board while she was lying at Stanley, Tasmania. Peter Conlon Davara. Motor vessel. Replaced the auxiliary ketch Will Watch, lost near King Island, 1958. On 22 October (year? ), a fire at Stanley caused by a faulty stove killed the engineer. I am seeking the muster roles of the US Navy ships that were in port in Brisbane in June/July 1941. Can anyone help? 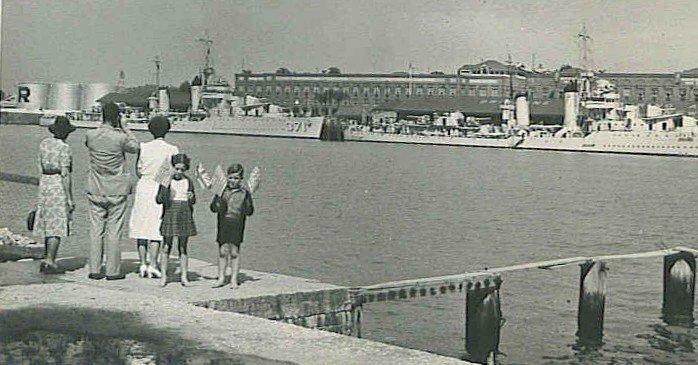 Do you have any information on where the memorial and fish markets were? I’ve had a bit of a look and a talk to the museaum up there but no luck so far. I’m taking the kids up on Sunday with our bikes to have a better look. 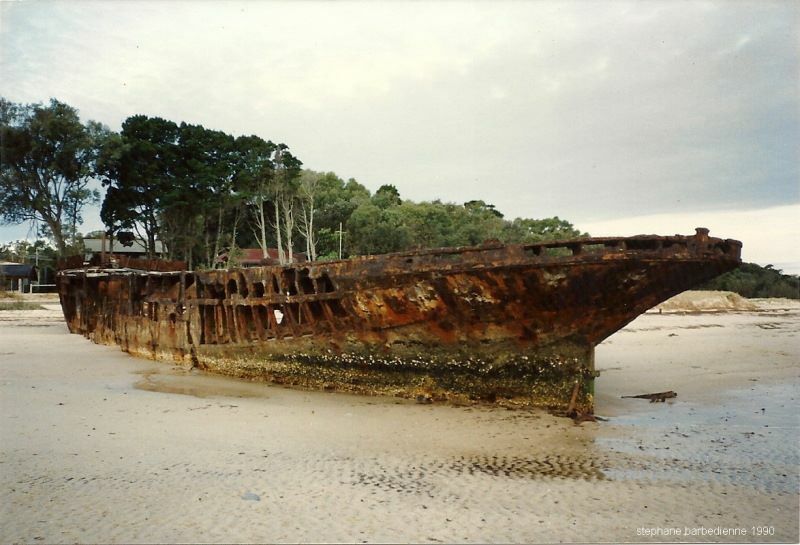 Does anyone recognise this shipwreck, supposedly photographed on Bribie Island in 1990?? Jim Lergessner of Woorim on Bribie Island has provided an answer to the question of the identity of the hulk on the beach at Bongaree. 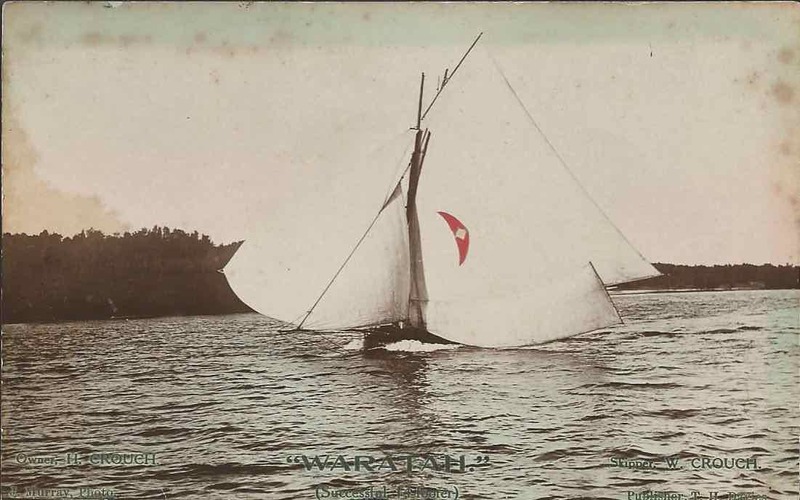 It was the “Cormorant”, a former pilot and survey vessel, and later used as coal barge. In the late 1950s it was towed to the beach to be positioned as a groyne to stop sand erosion. Jim tells the story that the men who towed the vessel to Bribie got on the grog and the tide went out before she could be properly positioned. So the hulk stayed where it was! It continued to be a popular attraction to visitors and local kids alike until the Council deemed it unsafe and demolished the remains in 1991. Does anyone know which vessels these old anchors came from? 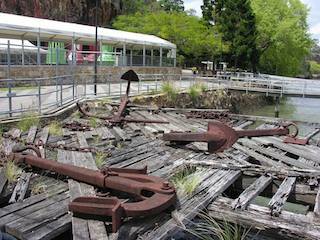 They are on the remains of wharves below the cliffs at Kangaroo Point, Brisbane. Do you think just maybe they could have come off the Bucket Dredger S.D Platypus ??? 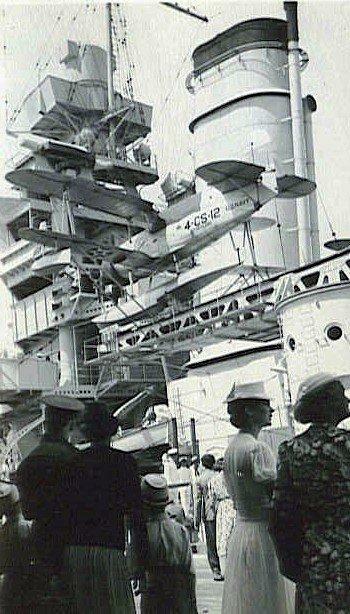 as she worked up that top end of Brisbane River for many years in the 50s. Do you have any information about early settlers seeing the wreck of a ship south of Jumpinpin (Not the Cambus Wallace, I mean an earlier wreck)? John W S Willes had also seen this. There was a reference to the wreck in Mr Wille’s personal papers, another one in a lecture held by marine archaeologist A J Pixley in 1970. The wreck was there until 1872, the date it appeared there however is uncertain. The Russell Island Museum there are a some exhibits of interest. Do you know if any of them had possibly been taken from the wreck at Jumpinpin by early settlers? I don’t have any information about the vessel in my books but Lance Paterson in his two volumes “Wreck-ollections” mentions three possibilities for that time period: The “Jane” a Brigantine, 180 tons. Captain Gould. Lost on Stradbroke Island, 17 February 1857; the “Triumph” Schooner, 130 tons. Struck a reef off Stradbroke Island, 9 August 1866; and the “Salamander” a schooner of 87 tons, beached 21 January 1868, Stradbroke Island. Just wondering, if you know anything of the ship POLMAISE, arrived Wide Bay 1872, I am helping a friend with a family tree, and it appears that the TREVITHICK family that she is researching may have come out on the POLMAISE. Any help or suggestions as to how I might find a passenger list would be very much appreciated. Here is a picture of the ship my father was on board, MV Havfru (“Havfru” is the Norwegian word for “Mermaid”), taken in 1941, just after the accident. 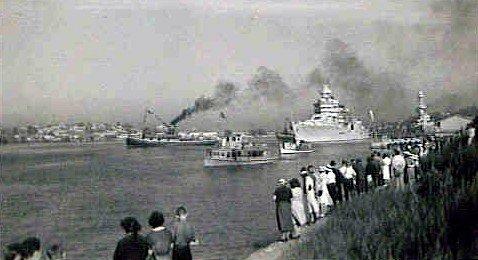 The picture is a 1941 view of the Norwegian tanker MV Havfru (Norwegian word for mermaid). Taken in Moreton Bay as she underwent inspections and temporary repairs after running aground near the Cape Moreton lighthouse on July 14, 1941. (Note the 6 inch gun aft). 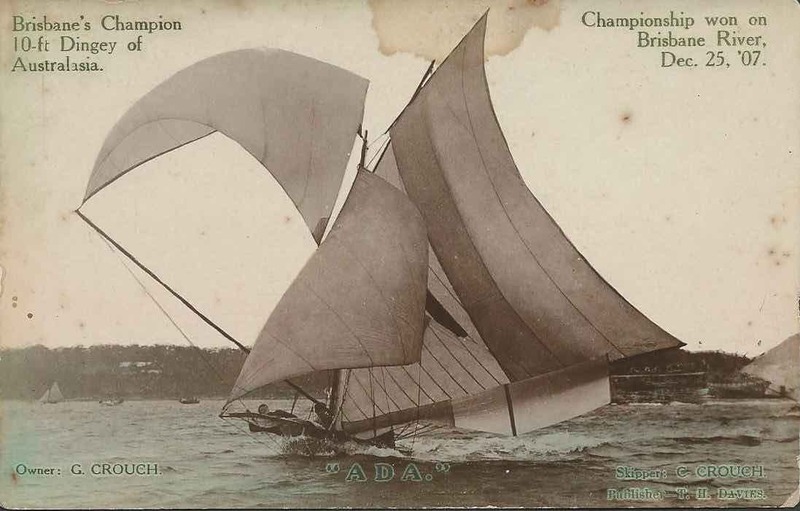 To Tom Raabe: I have a 1920 photo of a wreck on the south end of South Straddie. Only part of it is exposed and no name given. The Southport bar was a graveyard in the 1960s with prawners regularly sunk. Oddest was Max Hoppe`s Torpedo which drowned him. It surfaced for a while from under the sand. but in spite of flotation and a trawler tugging, we couldn`t shift it. About 30 feet long, it was designed to drive down the beach and rescue swimmers at Main Beach. Still there today, probably under the north wall of the Seaway. 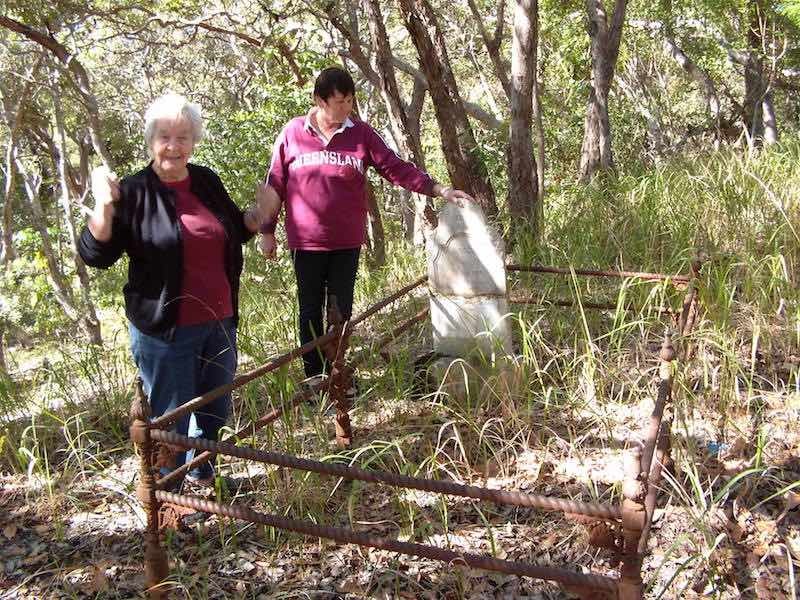 I think one of Isobel Hannah`s letters or articles might refer to wrecks on south end of South Straddie, Tom. The property to the right of the wreck were boat builders in the day. Maybe they could shed some light. An elderly lady used to live there with younger family.